Treavor Moontribe is one of the co-founders of the Los Angeles based “Moontribe Collective” and its legendary full moon desert gatherings. Since 1993, these events have been at the core of Southern California’s underground electronic music scene. Treavor established himself as one of the top Djs in LA thru these events and has since traveled the world from Brazil to Japan to Morocco, Portugal, Germany and all over North America. As a Dj it’s always been his diversity that’s set him apart from his peers. As Treavor always says himself he refuses to be “Genre-Fied” or be a one dimensional DJ. His love for music spans multiple genres and his DJing reflects this. 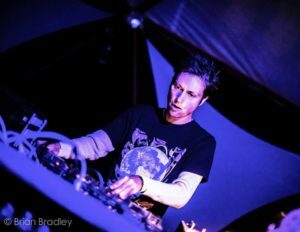 Although he is most well known for Psy Trance and Techno styles, Treavor prides himself on having the ability to fit in anywhere and anytime.